Bhindi masala is a simple and popular main course dish made with lady’s finger/bhindi cooked in onion-tomato paste and spices. This goes good with any Indian Bread like Phulkas, naan, Rumali roti. 1.Wash the bhindi (okra) well and wipe it with a clean kitchen towel and let it air dry completely without any moisture. 2.Cut the base and the tip of the ladyfinger. Then cut it into 2 inch long pieces. 3.Chop the onion and tomatoes finely and keep aside. 4.Heat a pan with oil and Add the okra/bhindi and sauté over low flame for 8 to 10 mins. Keep turning with a spoon frequently for even cooking on all sides. Transfer to a plate and keep aside. 5.Heat remaining oil in a pan. Add jeera, when they begin to crackle, add finely chopped onion and sauté until it turns light brown. 6.Add green chilli–ginger-garlic paste and sauté for a minute. 7.Add chopped tomatoes &tomato puree and cook until oil starts to separate from it. 8.Then add, turmeric powder, chilli powder, coriander powder, cumin powder, garam masala powder, salt needed and cook until tomatoes become mushy. If the masala mixture becomes dry, you can add a tbsp of water. 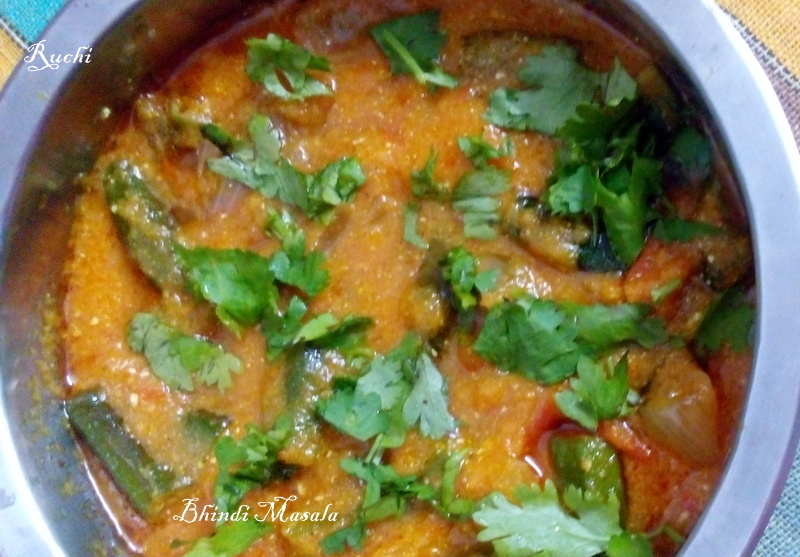 9.Add the sautéed bhindi and curd to the thick gravy. Mix well and let it cook for 2 more mins. 10.Turn off the flame and transfer prepared curry to a serving bowl. 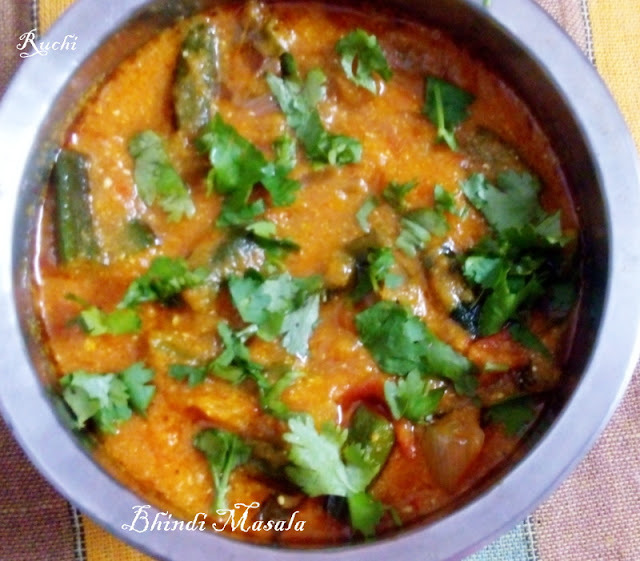 Garnish bhindi masala gravy with coriander leaves and serve hot. * Add pinch of sugar to balance out tangy flavor of curry.